In general, if you need a 7.5v supply the most obvious answer is that you would use a two cell battery pack. The operation range would be 8.4v-5v from full to flat, the useful range would be from 8.4-7 or so for most applications. Boost converters are generally not necessary in this hobby since LEDs operate at less than battery voltage. Some saber boards do incorporate boost circuits either because a chip (usually the speaker amp) requires higher voltage. These are usually only for milliamp loads though. Depending on how much you want to boost, you will need some excess of amps from the battery. If you want to boost from 3.7 to 7.5 at 3amps (according to a few calculators I checked) you might need as much as 10-15A out of the battery. Going in the other direction, a buck converter will still waste some of the energy as heat, but since you are starting from a higher potential, the demands aren't as severe. If you have a constant current driver, the intensity will remain even until there isn't enough current to drive them. Some boards do incorporate these to drive the LED. As for resistors, the intensity of the LEDs will change over the discharge curve of the battery. A full battery is 4.2v and the minimum safe discharge is 2.5v. The protection circuit should prevent it from going lower. They are also cheaper and easier to calculate and install. It's really more complicated than all of this, but if you want to learn more than I recommend doing research on electrical engineering forums. The curve for Red XPE-2 LEDs is essentially linear, this table gives an example of how choosing different resistor values could affect the heat dissipation. The last column is the relative flux from the datasheet, which also appears to be more or less linear. 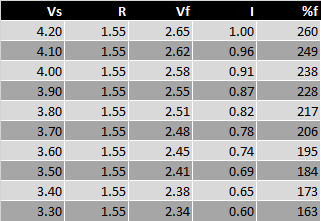 The first table just gives design points, obviously when the value is neither 4.2 nor 3.7 the current, Vf, and LF will all change. I've decided to get a bunch of components and test out the efficiency, I'll try a) boost converter paired with a current regulator and b) linear regulator. Option b) might work effectively if I use lower voltage LiFePO4 batteries. A couple people in the flashlight community have reported success with this method, esp with regards to red XP-Es. I'll share the results when all the parts arrive. The tables are based on napkin math and datasheets. They are just for reference, but they give a good idea of how resistor values and battery level affects flux. Different LEDs will have different characteristics, but the math will be similar. As for the 1 amp, that's correct, but it's still a big drain probably around 4A. It would be far better to just use a series pack since it puts you at the right voltage. The capacity of the 18650 7.4v pack @ 1 amp will be better than your 23650 at 3-4A. I look forward to seeing the results of your experiments.